Hello, and welcome to JT Hughes. Today I'll be showing you around one of our used vehicles. This one is a BMW 216 diesel. It's covered 51,796 miles and comes in Metallic Silver. This one, being the BMW Luxury Edition, comes with front and rear parking sensors, a rear parking camera. As you can see, very, very nicely kept inside and out. this vehicle has mudflaps already fitted. One of the features of this vehicle, there's automatic opening tailgate with very nice and clean, tidy boot and plenty of storage as well. The vehicle, in general, is in absolutely lovely condition. This one comes with a set of front fog lights. And now, let's just take you inside the vehicle. As you can see, very nice place to be sat. Full leather interior on this vehicle. 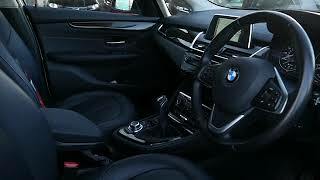 This one also has a multi-info display, which parries up as your satellite navigation, 6-speed manual gearbox, and also your climate control air conditioning. Hands-free telephone kit and also cruise control is one of the many features this vehicle comes with. This vehicle will come with a benefit of having a three-month warranty which you can upgrade to 12-months for a cost of £299. Flexible finance is available on this vehicle as well, subject to status and availability. But for more information on this particular vehicle, please contact JT Hughes of Shrewsbury. Is the shame game the right solution to Shropshire motorists who misuse accessible parking bays? Investigating the abuse of parking in accessible parking bays.